The Rally is what Slingshot call an “Open Delta C” hybrid kite with a medium diameter leading edge with 3 struts and an overall delta shape with high curvature convex LE coupled with a concave TE. It has a pulley-less bridle which gives the kite good support and allows it to pivot very well for good depower. 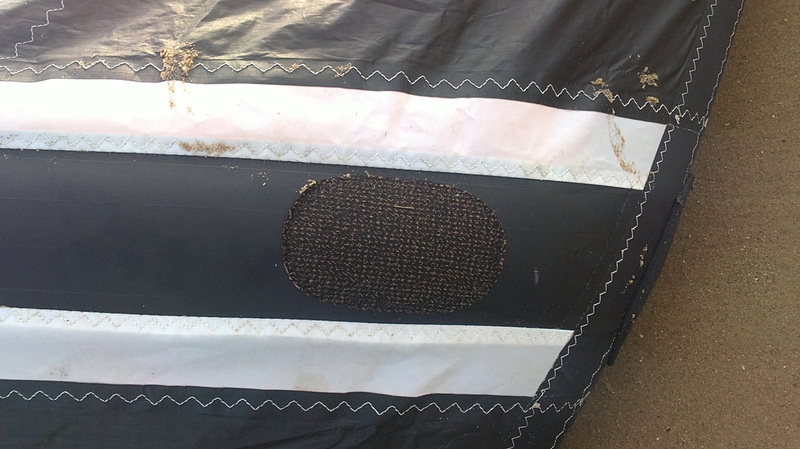 The kite is well reinforced in all the places youd expect, and the stitching is up to Slingshot’s usual high quality. The Rally is notable because it comes with split struts - rather than having them sewn on underneath the canopy, the canopy is split and sewn onto either side of the strut. Like all Slingshot kites, it’s a one-pump affair – which gets you out on the water quickly, and is quick to pack away also. There are three rear line connections options to adjust bar pressure and response. The slingshot bar is a meaty affair, and is a product of real quality. The bar itself is weighty with a rubberised grip which looks like it will stand the test of time. The safety system looks up there with the best of them – a push away release which flags the kite onto a single front line and a ‘suicide’ attachment point to cover all bases. The Chicken loop on the Rally bar is significantly smaller than those of the Fuel and RPM. The flying lines are exceptionally good also – 800lb front lines with thinner rear lines to reduce overall line drag. 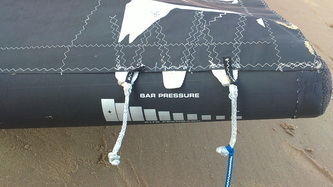 The bar comes with a clam cleat beneath the bar which will please anyone who normally struggles to reach above the bar sheeting systems.The larger kites in the range come with a 23 inch bar and 27m lines, mid-sized kites use a 20 inch bar with 23m lines, and the smaller sizes use a 17inch bar with 20m lines. The Rally feels great in the air, responsive steering, reasonable power in the turns and with a medium light bar-pressure, which increases as the wind does to help iron out the gusts. 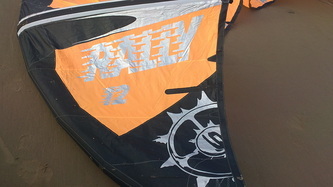 Its canopy creates a good deal of force without the need for working the kite in order to generate it. Launch and re-launch are excellent - the kite rolls effortlessly on the curved leading edge allowing it to proceed swiftly to the edge of the window. The Rally is a great free-ride performer - it generates effortless power when left still in the window, which accelerates you up to an impressive top speed. It drives upwind very well, and produces some incredibly lofty jumps from which you float down very nicely - its also great for slamming out big transitions, turning heads close to the beach. Unhooked the rally is very capable also, it sits in the air happily and produces huge pop when you edge hard against it, but does keep on pulling through the air without generating much line slack (which is why it boosts so well!). Its perfectly capable for what the vast majority of people would ever use it for however. The rally loops neatly but doesn't generate as much power in the turns as a more dedicated kite like the Fuel or RPM - but still more than enough for most people. The Rally is a great freeride crossover kite with plenty of performance for big air freestyle and basic wakestyle, and will have a very wide market. Its a kite which a beginners will love due to its simple relaunch and ease of use, intermediates will appreciate its top end speed and huge lofty jumps, and there's plenty of performance there for advanced riders to race with, push freestyle & wakestyle or to go aggressive with it in the waves. Dedicated wake-stylers or kiteloop mentalists should probably check out the Fuel or RPM, but otherwise the Rally produces performance which is hard to fault.